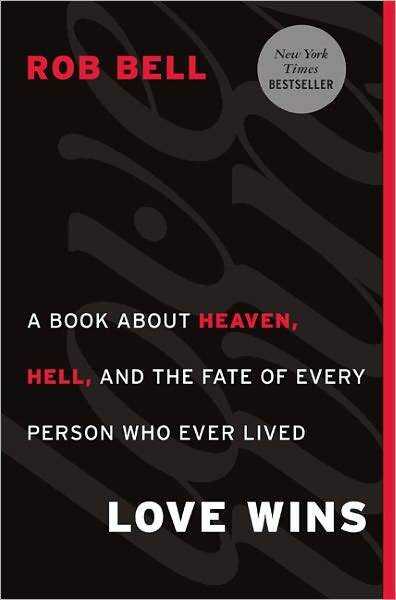 In his controversial book “Love Wins,” Rob Bell explains his views on Heaven and Hell. How do you get to Heaven? Who goes to Hell? Is that really the point of it all? My summary of the book is short. A LOT shorter than I usually do a summary. There’s a reason for that. If I could choose just one word to describe the way this book left me it would be this: confused. First, let me say that there are times when I was able to say, “He makes a good point here.” This mostly occurred when he described the way the church in general interacts with the world and the fact that shouting at people that they’re going to Hell doesn’t really show God’s love. Other than that, this book was filled with questions. Tons and tons of questions that Bell never gives an answer to. His use of scripture within his arguments often left me confused and wondering… so… does he believe in Hell or not? Ultimately, the impression that I got was that he does not believe in an eternal Hell, but believes that rejection of Jesus leads to a living hell in this life. The things that bothered me most about this book is Bell’s flippant, often mocking tone and the fact that the book never really answers anything and seems to have no point. You would think that at almost 200 pages I should be able to type up a decent summary for this book, but it is written in such a way that it becomes the theological equivalent of the philosophical “do I really exist at all?” Question after question with no real answers. Unfortunately, this makes whatever good points he made go out the window as they get lost in the jumble of everything else. Finally, one thing that I strongly disagree with is Bell’s belief that people who are Heaven-minded (always thinking of, or focused on, Heaven) don’t think much about the needs of this world: i.e. the homeless, the hungry, the abused, etc. I have seen people and organizations who are very Heaven-minded who put in relentless effort to meet the physical, emotional, and spiritual needs of people around the world. I read this book because it had so much controversy around it, and I really don’t like to take other people’s word on things like this. I wanted to read it for myself. I have, and I’m glad I did if only for the fact that I can say I read it for myself. I’m not taking the word of anyone else. My opinion? There are books out there that make the same good points that Bell makes here and do it in a better way, with better scriptural support, without the mocking tone, and with actual answers.